The first page of the FAMILY Chipboard Album. The chipboard is covered with a Chocolate patterned paper from the Simply Scrappin' Kit. 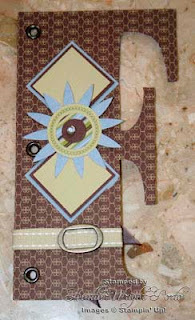 2 sets of squares were punched with the 1 3/8" and 1 1/4" punches in the Blue and Chocolate Chip textured cardstock. The inner squares (River Rock textured paper) are 1/8" smaller and manually cut with the Table Top Cutter. Trace the letter "F" chipboard piece onto the Designer Series Paper (DSP). Cut out and adhere to chipboard with SNAIL Adhesive. I used SNAIL glue on the chipboard as well as some on the DSP for a better hold. Using the 1-1/4 square punch, punch two pieces of textured River Rock paper. Using the large square punch, punch two pieces of textured Chocolate Chip paper. Cut two 1-1/2 inch squares out of the textured blue cardstock. Adhere the River Rock squares to the Chocolate Chip squares and then adhere them to the blue. Layer several stickers (floral, circles) together to make the main focal point of the "F", which will lie between each of the diamond squares.